Mention the name Frank Cognetta to high school sports fans in Connecticut, and there’s first thing of football. For good season, Cognetta, a running back for state champion New Canaan High School, rushed for 1,225 yards and 15 touchdowns this past fall. But in lacrosse, Cognetta is also one of the top defenders in the Fairfield County Interscholastic Athletic Conference and that’s the sport he’ll play at the next level. The junior has verbally committed to the University of Richmond, a decision first reported by Joe Lombardi on LaxLessons.com’s Lacrosse Insider premium coverage section. “There absolutely were moments where I thought that I wanted to play football at the college level, however I think I made the right decision in choosing lacrosse over football,” Cognetta said. The level of recruiting interest, with many more Division I lacrosse than football programs pursuing Cognetta, played a big factor as well. But it was still a difficult decision for Cognetta, who has been playing football since first grade. “The decision regarding recruiting was seemingly easy, considering I was getting many more looks for lacrosse, but in terms of choosing one sport over the other, I had a very difficult time doing that,” Cognetta said. “I’ve been playing football for as long as I can remember and I loved the brute force behind it. The 5-foot-9, 185-pound Cognetta is a lefty with good strength and stick skills who excels in transition. Now, here’s a Q&A with Frank on his commitment. I would say the biggest factor in my decision was going to an academically strong school that would help set me up with a good college education. It was very important to me that I put academics before athletics. After that, I think that the size of the school really was a big factor. I knew I wanted to go to a smaller size school with the kind of “everybody knows everybody” kind of feel. Finally, I really felt a sort of connection with (Richmond Head) Coach Dan Chemotti and the rest of the coaching staff at Richmond. I was familiar with his resume and had full confidence that he could make Richmond a great lacrosse team in the near future. In addition to Richmond, I was considering/visited Loyola, Army, University of Michigan and Rutgers. I like to think that I’m a strong team defenseman. I’m pretty disciplined, I try to communicate as much as possible and I like to think that I slide well when necessary. I also love playing with the ball in my stick, mostly on clears. Finally, I think that I do a good job matching up against attackmen one-on-one. One area of my game I am definitely working on is improving my speed and agility. I feel that when I get beat, it’s almost always because of that reason. I was introduced to lacrosse when I moved from North Stamford, Conn., to New Canaan, Conn., when I was about 8 or 9 years old. Initially, I was a baseball player (my father was a big baseball guy), but since New Canaan was mostly dominated by lacrosse, I figured I would try it out. I played both for about 4 years until I decided that lacrosse was the sport for me. These past few summers I played for the CT Chargers, however this next summer I am going to play for the Eclipse Lacrosse Club. 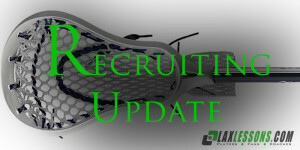 In terms of showcase events, I have attended the Nike Blue Chip Lacrosse Camp, Under Armour All-America Tryouts, Trilogy Lacrosse Camp and the Michigan Wolverine War. I would like to thank a few people. First, I would like to thank my parents for doing everything from buying me my first lacrosse stick to driving me countless hours to visit schools. In addition to that, I would like to thank my coach Chip Buzzeo (at New Canaan High School) who has been a fantastic coach and role model and always been there for me throughout my recruiting process. Without them, none of what I have done is possible. Good luck today vs. St A’s Rams!